The Kansas Prayer Breakfast has been an ongoing annual event for over fifty years with speakers ranging from Congressmen, Senators, Former Presidents, & Leaders In Business. This year, join David McAlvany, author of The Intentional Legacy & CEO of the McAlvany Financial Companies as he presents a strategy for “reverse engineering” your life and legacy. David presents a redemptive ethic for family prosperity based on love, forgiveness, and non-contingent relationships. You must purchase tickets to the prayer breakfast before March 1 in order to attend. Uncertain financial and political times require us to avoid following the conventional path of least resistance, which would be to step back and watch events unfold. We, as intelligent investors and people in leadership positions, should not be bound by convention. We should respond to doubt with action. We should view uncertainty as a summons, a clarion call to look beyond mainstream wisdom in search of our own truth and personal discovery. As a perpetual student of world markets, and as a man who has been preparing for his role as lead economic investigator and world news maven his entire life, David has hosted the McAlvany Weekly Commentary for more than a decade now. It does not proclaim to hold “the answer.” It does not pretend to be a truth bearer on high. From its inception, the commentary has sought to look deeper, analyze more extensively, and ask better questions. 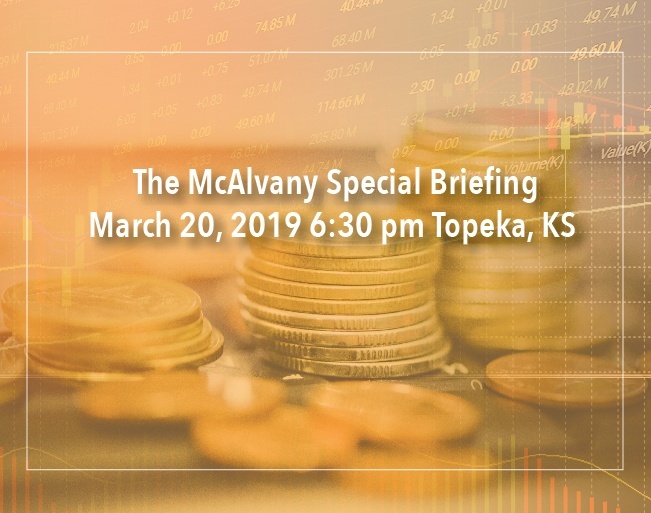 The evening after speaking at the Kansas Prayer Breakfast, David will host an invitation-only briefing where he will present the latest and greatest world trends and themes that affect, and will continue to affect, all of us. He will provide evidence of these themes, discuss what to expect, and offer solutions on how to navigate them. This is your opportunity to hear him live, raw, and to ask those questions you’ve always wanted someone to answer candidly and with care for the outcome of how things may affect you and your family.